Ric Richardson is an inventor and writer of patents, but rather than try to explain exactly what that is, you’ll be better off checking out his blog where you will no doubt be blown away http://ricrichardson.blogspot.com.au. And for those who don’t know, he and his company Uniloc have been in a legal battle with Microsoft for umpteen years over the unauthorised use of one of Ric’s inventions… your classic David and Goliath battle. The good news is, ‘David’ won the battle, reaching an out of court settlement with Microsoft. Congratulations Ric. I first tried to contact Ric in August 2011. He had been mentoring a long-time friend of mine who happened to mention me, and Very Byron. She reported he was open to being interviewed and to contact him via his blog. Ric is a highly sought after man and understandably, isn’t easy to contact. So after three attempts, I gave up. Fast forward to March 2012… while I was at the Beach Cafe I was distracted by the most gentle looking dog waiting patiently for its owners to breakfast. Unbeknownst to me, the owners were dining right beside the dog on the other side of a barrier. And, as often happens when patting dogs, a conversation was struck up – not with the dog, but with Max’s very proud parents. Once my eyes were dragged from dog to humans, I recognised Max’s dad as local and international Inventor, Ric Richardson. (I had read an article about him in the local paper and had seen him on Australian Story some years back.) He, and his wife Karen, were breakfasting together yet were gracious in accepting my interruption, with Karen warmly extending her hand to introduce herself. Taking the chance meeting as a gift, I quickly set about arranging another time to meet to chat further about all things Byron. 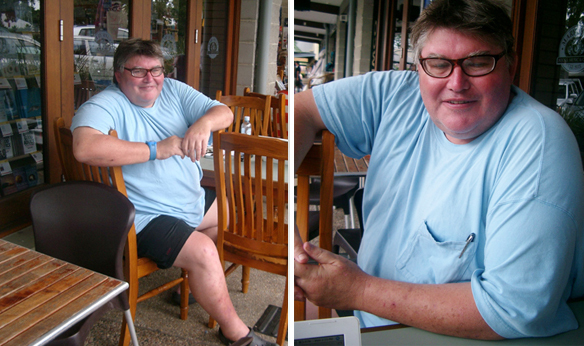 Ric sharing the cafe love… this time at Mary Ryan’s where we met for our chat. Well, we had been living in California for 8 years but felt it was time to check in back home (Sydney, Australia) and during that visit we came to Byron for a holiday. My Uniloc co-founder, Craig Etchegoyen, was running the business so well that I was like an udder on a bull and didn’t need to stay in the States. So I asked Karen where in the world would she ultimately like to live and she said Byron Bay. So we moved here three years ago. Byron is the epitome of what we missed out on in the States. Life in the city is very serious…. it’s like everybody is working just to pay off their mortgage. They’re all talking on their cell phones and not stopping to take time out. Here, we’re surrounded by happy holiday-makers, people who are ‘stopping’ and enjoying the environment for what it is. It is a totally different vibe. But living here makes it tricky to work out where to go for a holiday. So… where do you go for a holiday? Well, that’s a bit of a problem. I’ve made attempts to go to places within 15 kms of a decent restaurant. It also needs to be a bush environment and not too far from the coast because I can’t cope without the sea breeze. I like to go somewhere I can take the dirt bike or go four-wheel driving. I’ve been into that and surfing since I was a kid. Simple barbecues and using the sun instead of a watch for three weeks is my idea of a holiday. But I have also been exploring the idea of eight week cycles. As an inventor you are fairly on when you are following a thread of an idea. You are fairly focused but I find after six weeks my focus wanes, so I’m exploring the idea of working for six weeks, followed by two weeks off. Can you tell us a little bit about how you work? Well, I first have to find a nice location from which to work and that varies on my mood… it’s good to phase out traffic noise and voices because to problem solve and think creatively requires focus. Your mind has to be really clear. I have five or six favourite places where I park my van… all with a view. Sometimes I might park at the beach, other times under a favourite tree. 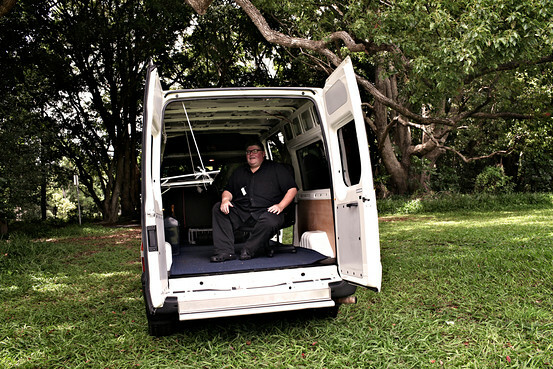 My van has a desk and an office chair and I open up the back door and get into the space to solve a problem… cause that’s what inventing is… it’s problem solving… it’s the essence of proactivity. You’re solving a problem and creating something novel… you can’t use a pre-existing idea. A good example of the process was when I was back in California and Craig asked me to solve a problem. It was a pretty tall order and a really important issue so I set out on a mission to solve it. The first week I experimented with trying to find the right location, the right vibe to problem solve. I tried nearby parks and the beach and eventually found a big tree in a local swimming pool car park. Then the next week I came to that spot every day brainstorming different angles on the problem and just drawing a blank. Since these steps are actually part of the problem solving process I could tell Craig that things were coming along, when all I’d really done was get in the right mindspace for something to happen, even if nothing had really happened yet… and then voila… one morning I just woke up with the inkling of a solution in my head and by the next morning I was showing the patent to Craig. It was three weeks since being asked to solve the problem. Craig was genuinely amazed. However, somehow Craig knew what Id been up to (he has a sixth sense about me) and said that he suspected that I had only come up with the solution the day or two before. I tried to get out of it but confessed and he said, that’s ok “I could have had ten top engineers working for three months and not come up with a patent a tenth as good as what you did”. That’s what it ‘s like to work with Craig… genuinely rewarding, but no chance of pulling a fast one on him… he’s too smart for that. The upshot of the story is, if you create the space and allow the mind to really focus… the mind is clear and you can do incredible problem solving. 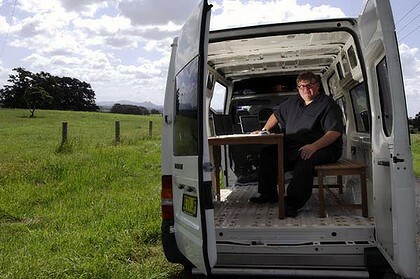 So you just drive around till you find the right place, park your van and prop your lap top? Yes, except I try not to work on a computer… I prefer to use pen and paper. Sometimes I use a computer for research and experimenting. Bringing it back to Byron… you mentioned earlier you like being around holiday-makers. Is there anything else you like about living here? Yeah, well… as I mentioned, it’s great to live everyday life around people who are on holidays, ‘cause generally they’re happy. Plus both Karen and I think it is the most beautiful place in the world. I know that’s a big statement but we have seen plenty of beautiful places. While we were in the States we went to The Redwoods and The Grand Canyon, which are both beautiful… and Sydney Harbour makes Sydney the most beautiful city in the world, but it is more than the natural beauty here. There’s something in our bones that makes us want to live in Byron Bay. We really like the city-quality of food and accommodation offered here, yet it’s still country. Having come from an executive lifestyle in California we’re used to enjoying a nice meal out… a meal that is good quality and fresh with a bit of thought put into it… with a cappuccino that isn’t scorched. We have that here, plus we’re treated like neighbours… I love how you can go into one of your regular haunts and the staff know straight up what you’re going to have. Yeah, getting to Sydney. I have to go there a lot and I am over the time it takes. It takes an hour to get to Coolangatta airport, then an hour of waiting for the flight (if you’re lucky enough to avoid delays), another hour of flying time, an hour to get to your destination followed by an hour of meeting. Then you’ve got to do it all over again on the return leg. It makes for a long day and that’s a pain. I love it when someone sponsors an over-nighter and I fly in and out of Ballina. For some reason I find the drive from Ballina psychologically shorter than the drive back from Coolangatta. So I would like a turbo prop plane to pick me up at Tyagarah, which would mean getting to Sydney in an hour and a bit and eliminating the driving and flight waiting times. I could get down and back in a day with ease. The other thing that would make life easier here is full-screen, high-definition, high-speed broadband to enable better conferencing. That would reduce the need for face to face meetings. Being a logical person, how do you find living in a region that embraces everything esoteric? Karen and I see Australians as being very accepting. It is one of the strong points of the Australian psyche… in Byron we are part of an accepting and encouraging community. And whilst Australians are generally conservative there is something about living here that seems to bring out the accepting side. Take the dancing man for example… do you know that Byron dancing guy, Tommy Franklin? http://tommyfranklin.net He normally dances in the streets and on the beach but he did a bit of a silly thing recently where he was dancing on the counter at the Ozigo BP…. but everyone was very accepting of this guy (who if you didn’t know his story would presume he was on drugs) and undeterred, continued about their business. Anywhere else the cops would have been called. But not in Byron… Tommy is free to be Tommy. I thought some friends of mine were trying to set me up. They got me to pick up Karen to go to a mutual friend’s engagement party. Because I thought it was a set up I was a bit suspicous and nervous, but she was so comfortable and easy to be with I thought, if this is a set up then it’s something I want to be part of’. She was so comfortable, so honest… not self-conscious at all, which I really liked. Not long after that, we both knew pretty quickly we wanted to be serious. 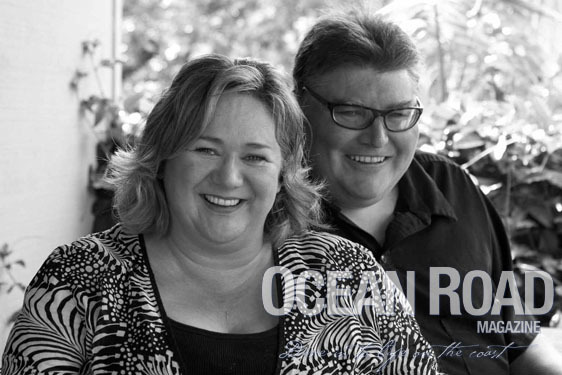 Another gorgeous pic by Brian Usher of Ocean Road magazine. 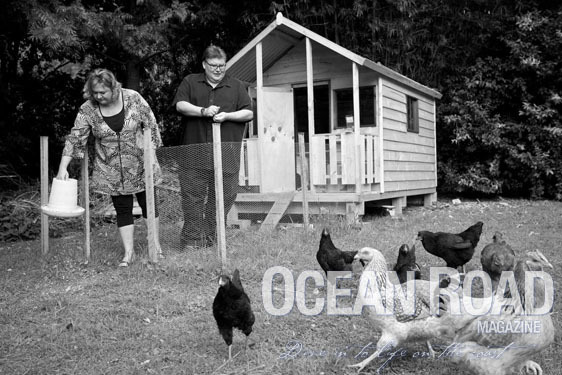 Ric’s wife Karen with her number one chook. I am very good at the invention side of things but I’m not very good at so many other things… she complements me. She treats me like a king and she supports my work. She makes me feel special without it being a corporate thing. She makes me feel special about being a provider. I am spoilt… she often brings me tea when I’m working at home, but she’s no tea lady. She’s never had to pay a bill since we’ve been married and she really appreciates that and demonstrates it daily. We take Friday afternoons off and we go anywhere from Conti in Brunswick Heads down to Quattro at Lennox. She really likes Japanese and drags me to sushi from time to time. Since you are an inventor, or problem solver, when are you going to fully extend your abilities and solve BB’s traffic nightmare? Ban Queenslanders, he says, laughing as a true Blues supporter. Actually, I did my own statistics when I first came here and discovered that during the off-season one in every two number plates were from Queensland. During peak it was one in three, with a mix of Victorians. Last summer was eight to one. I don’t think we have a traffic problem… we have a people problem. The current traffic issue is actually self-regulating. The problem lies with getting from the industrial estate through to Suffolk Park, which is local traffic only. The current Byron tourist strategy seems to be attracting day trippers with their cars and I think we need the higher value visitor… those who plan their annual holiday here and stay for a week or more, not one day. Do you think the increase in day-trippers is a result of the Byron Naturally campaign? Yeah, but it’s back fired because day-trippers don’t spend the way holiday-makers do. Day-trippers come down with their eskys full of ice cream they bought cheaply in Robina. They won’t spend their day standing in queues for a ‘tourist priced’ ice cream… they buy it locally and pop it in their esky and bring it down with them. Holiday-makers spend more time here and consequently more money, trying the different cafes and restaurants and shopping on the non-beach days. They’re a better quality visitor. Speaking of eating out, which we know you like to do regularly, what’s your favourite restaurant? It’s horses for courses… no, that’s not a restaurant! If I need serious space or somebody has made a big effort to come and see me, I‘ll go to Byron at Byron. Mokka from my first visit to Byron has always been my downtown hub… they treat me like a friend and it is consistently good. I also like Fish Heads and the Beach Café. We’ve also become friends with the owners of The Pass Café and Liz out at Luscious. It’s like being a neighbour at all these places… there’s a strong sense of community. Given that Byron relies heavily on tourism… do you see the possibilities of other low impact industries opening up here? How do you see the region in twenty years? (Long pause whilst he thinks)… I am not really in the development mind space. When we came here I liked the country town aspect with some great city amenities. I know it’s a really great environment for creative, free thinkers… so cultural events and festivals could be further enhanced. I don’t think they are currently being fully tapped into. Take the Writers Festival for example… it’s about the right size, six to eight thousand people, and I think it’d be great to have the likes of two of that type of festival a month. I’m sure the local businesses would benefit greatly with more events that size, ones with lots of multi-night visitors. I have had people ask me about technology and the idea of holding a technology event of some kind, but to get the really big players in technology you’d need the right venue, and whilst Byron at Byron is a great venue I think it would be too small for intimate, high-end events of say 1500 people. To date there hasn’t been a suitable venue in Byron, however, I believe the new sports and cultural centre has the capacity. Steve Jobs was a big believer in taking acid for creative inspiration. What are your creative stimuli? I find any mind altering substance really cramps my style. I aim to have as clear a mind as possible. Anything artificial cramps my thinking. You’ve got to look at the context and framework of Steve Jobs’s up-bringing… he may have thought he needed drugs to break out of that framework. He didn’t have a loving, supportive upbringing like I did. I’m not really an outgoing person. I like interacting with people from a creative perspective but I’m not one to shoot the breeze via social media. On the flip side, the hidden agenda on social networks is to encourage people to be more gregarious than they actually are. It encourages us to expand our network of friends. No, because it’s not real. One of my inventions is using the principal of vouching to build small, very well maintained social networks. So you have to have two people vouch for you to be invited into the network. eg if someone does something offensive, it ruins reputations and the network is severed. Being reputation-based provides tighter self-regulation and more accountability. Sounds like a great idea (check his blog for more), but unfortunately we had to wrap up our chat as Ric had already been incredibly generous with his time and had several prior appointments before our meeting. (He dedicates Friday mornings – the day we met – to pro bono work where he meets with budding inventors to advise and guide them with their concepts.) Wow, he must have been so over coffee and chatting by the time he met with me… but did he show signs of it? No way. He is one of the most kind, generous, warm, genuine guys you will ever meet. No wonder Karen treats him like a king! Hi Brad, you will need to contact Ric Richardson directly via google.